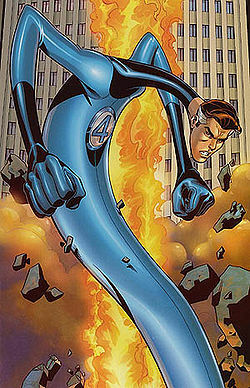 Artwork for the cover of Fantastic Four vol. 3, #52 (Apr, 2002). Art by Mike Wieringo. I’m all over the place here! I’m tremendously excited over some new concepts that I’ve been learning; concepts concerning human movement and how we function. A lot of it has to do with stretching but not necessarily the type you automatically think of (more on that in a little bit.) My difficulty is in how to write about all this without putting out a some sort of treatise. Maybe I’ll make it more than one part… Here’s the start. A recent Washington Post MisFit column tackles the issue of stretching. Is it beneficial or is one of those things that we do just because we’ve always done it? What’s the evidence that there is any benefit to doing it? I’ll tell you that I’ve done just about a 360 and then a 180 back the other way on stretching. Like most people I was taught that stretching was important so I did it but I didn’t really understand it. Then, several years ago I was persuaded to change my view. I became convinced that dedicated (static) stretching was not effective and not safe. Now I will tell you without hesitation that stretching absolutely must be done–in fact no human movement is possible without it! Remember that fact because it’s enormously important, and I’ll discuss it more later. Static stretching: This is probably what first comes to mind when you think stretching. This involves moving a limb into a position to the point where a slight burning is felt in the muscle and the position is held for anywhere from several seconds to a minute or so. Static stretching addresses passive flexibility. Dynamic stretching: This is stretching with movement. Maybe the best examples of dynamic stretching are found in the animal kingdom. Ever see a cat or dog wake up from a nap? Essentially, dynamic stretching involves moving limbs or the trunk through its available range of motion. You often see athletes do this prior to a game. Examples include kicking the legs, swinging the arms, twisting the torso, lunging and other such movements. Dynamic stretching often involves swinging an implement such as a golf club, tennis racquet, or baseball bat. Dynamic stretching addresses active flexibility. 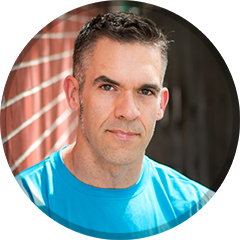 PNF Stretching – Proprioceptive Neuromuscular Facilitation: I won’t go into much detail on PNF as there’s a lot to it and I’m not terribly well versed on the topic. The popular perception of (static) stretching says it’ll reduce likelihood of injury, increase range of motion, decrease muscle soreness. Is any of this true? Well, the evidence is not entirely clear. There’s very little evidence that static stretching prior to exercise or competition decreases injury. In fact it very likely contributes to injury. Why? I won’t go into every single physiological detail of stretching here but I’ll try to explain the big ideas as best I can. Static stretching actually weakens the ability of a muscle to contract. Though you may gain range of motion (ROM) from static stretching it also results in a less-active muscle and thus a less stable joint or joints which that muscle crosses. This phenomenon has been shown by testing athletes strength and/or jumping ability pre- and post-stretch. So if you stretch statically prior to your soccer or softball game what you’ve done is create weaker muscles and less stable joints. That’s not what you want. Dynamic stretching is safer and more pertinent to real-life situations. Dynamic stretching is now generally recognized as an appropriate activity prior to a workout or athletic even, as research (see ch. 3 of Siff’s Supertraining) has shown that active flexibility is more closely correlated to sporting proficiency than is passive flexibility. In this way, you wake up the nervous system and prepare the body for action. A dynamic stretch routine should include movements that you will perform in the workout or game. Examples include body weight squats, various lunges, twisting the torso and swinging and reaching the arms in various directions. How’s that for part I?